Coconut Oil Chocolate with Toasted Coconut. 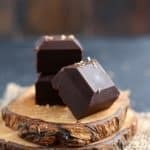 This coconut oil chocolate is so super smooth and delicious, plus it's a bit healthier than regular chocolate. 2 1/2 Tablespoons maple syrup You can reduce the amount of maple syrup if you wish. 1/3 cup toasted coconut flakes I used finely shredded coconut. Place the coconut oil in a microwave safe bowl, and microwave until melted, about 15-20 seconds. Stir in the cocoa powder and maple syrup. Stir until very smooth. Add the toasted coconut and stir again. Pour the mixture into a mold of your choice. This one makes squares, and this one makes a chocolate bar shape. Carefully place the mold in the refrigerator, and allow the chocolate to chill for at least an hour. Make sure the chocolate has solidified, and then remove it from the mold. Store in an airtight container in the refrigerator. Chocolate should stay fresh for about 10 days. You can store this chocolate in the refrigerator for up to ten days. This chocolate will melt at room temperature. Be sure to keep it chilled! If you don't want to add the toasted coconut, you can leave it out. You could also add cacao nibs, toasted quinoa, pumpkin seeds, or dried fruit.